The Lincoln Stars selected a total of seven players tonight in the 2014 USHL Phase 1 (Futures) draft, and I'll highlight each and every one below. 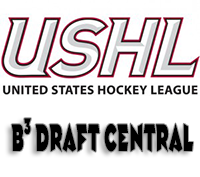 Click here to check out the league's draft website to view the selections made by all of the USHL teams tonight. All of the players selected by the Stars tonight were born in 1998, and are considered the best at their age group. Although they may not play for Lincoln next season, these players very well could be in a Stars uniform in the next couple of years. Lincoln's first selection in this draft is a player whom a few scouts told me that they were surprised he fell to the Stars at the #4 pick. One scout told me he thought Mersch would be one of the top two players selected. As a member of the Chicago Mission U16 team last season, Mersch scored 24 points (11g, 13a) in 23 games to go along with 66 PIM's. Dominick has already committed to play college hockey at the University of Wisconsin, starting the fall of 2017. Dom's older brother Michael Mersch played four years at the University of Wisconsin and is a Los Angeles Kings draft pick. So good hockey genes abound in that family. Dominick describes his game as, "I'm not a 1-on-1 guy that's going to go out and beat a bunch of guys. But I'll get the dirty goals and I'm physical, have good vision and can make plays. I'm a blue-collar guy." My kind of player. OHL scout extraordinaire Scott LaFortune described Mersch as a "game breaking offensive forward with soft hands and good mobility." The SBNation article I linked above indicates that Dominick will likely spend another season in midget hockey, then two years in the USHL before enrolling at Wisconsin. Click here to follow Dominick on Twitter. I believe Frank is the second Nebraska native drafted by the Lincoln Stars (first was Matt Bruneteau) in the club's history. Ethen is originally from Omaha, and last season played for the highly regarded Omaha AAA U16 program. The stats included in the link above are incomplete, but I've been told that Ethen scored 79 points (25g, 54a) along with 104 PIM's in 74 games played. With the 104 PIM's, I assume Ethen plays with a bit of a chip on his shoulder and isn't afraid to mix it up. Frank was drafted in the 4th round of the 2013 WHL Bantam Draft by the Victoria Royals. From what I've been told, Frank is more interested in playing college hockey than going the major junior route, but we'll have to wait and see how that turns out. Not sure if he's ready next season to make the jump to the USHL, but he is certainly is a player who could be ready in 2015-16. Click here to follow Ethen on Twitter. The only defenseman selected by the Stars in this draft, Schioler hails from West St. Paul, Manitoba, Canada. Last season, Liam played for the world-renowned Shattuck St. Mary's U16 program where he racked up 19 points (3g, 16a) and a whopping 102 PIM's in 68 games played. At 6'2", and close to 200 pounds, Liam has great size for a 16-year old. He obviously has some skill to go along with his big frame if he's playing hockey at Shattuck. Like Ethen Frank, Liam was also selected in the 2013 WHL Bantam Draft, going in the 2nd round to the Regina Pats. Here's a "profile prospect" video of Liam from the Regina Pats' website. Pats GM Chad Long: "Liam is a big body and a well built kid. He has a good skating stride, excellent agility and makes a good first pass.” Click here to follow Liam on Twitter. The native of Greenwich, CT suited up for the Long Island Gulls U16 (AMHL) squad where he potted 35 points (15g, 20a) and 42 PIM's in 25 games played during the 2013-14 season. In 2012-13, Jack played for the Connecticut Oilers U16 team where he scored 51 points (28g, 23a) in 54 games played. Click here to follow Jack on Twitter. Field hails from Tenefly, NJ and last season played for the east coast prep school Choate Rosemary Hall, which is located in Wallingford, CT. As only a sophomore on the varsity team, Field scored 4 points (1g, 3a) in 26 prep games. The "Over The Boards" scouting Twitter account said that Sam is a "well-framed power forward finding his way in prep school." OHL scout Sean LaFortune described Sam as "a quick, energetic pivot who plays a competitive 200ft game." Field was selected by the Kingston Frontenacs in the 6th round of the 2014 OHL Priority Selection draft. Good size for only a sophomore, and sounds like someone who could develop into a solid two-way forward. Sam was the youngest player on the Choate varsity prep team last season. Click here to follow Sam on Twitter. Nappier was the only goaltender selected by the Stars in this draft. In fact, I had to go way back to 2007 before I could find another goaltender that the Stars selected in a USHL Futures draft. Back in '07, the Stars drafted goaltender Ryan Walsh in the fourth round of the futures draft. That six straight futures drafts without a goaltender selected by the Stars. Useless, random trivia...I know. Anyway, Nappier played for the St. Louis AAA Blues (midget major) program last year where he had an impressive 16-2-3 record with a 1.65 goals against average and a .918 save percentage. Stingy numbers, for sure. Goaltenders normally take some time to develop compared to forwards or defensemen, so I would expect to see Nappier in a Stars uniform in the next season or two. Click here to follow Tommy on Twitter. The Toronto, Canada native played for the Toronto Marlboros Minor Mdgt AAA squad where he scored 25 points (9g, 16a) in 27 regular season games played. In 16 playoff games, Harris scored 20 points (10g, 10a). Jacob's team this past season was coached by NHL hall of fame defenseman Paul Coffey. OHL scout Ryan Yessie said on Twitter that Harris has a "great work ethic, battles hard for pucks & has good offensive upside." Jacob was selected by the Missasauga Steelheads in 10th round of the 2014 OHL Priority Selection draft. So like the players listed above who have been drafted by a OHL, or WHL team, Jacob will soon need to make the decision of either playing major junior hockey (and voiding his college hockey eligibility), or playing in the USHL. Time will tell. Click here to follow Jacob on Twitter. That's it for the Futures Draft! If you have any more information about the players noted above, or if I have posted incorrect info, please email me at lincolnstarshockey@gmail.com. Thanks for reading! Check back here tomorrow morning for the results of the USHL Phase 2 (Entry) draft.